It’s true in every sport. There’s a reason games, matches and competitions are held. The pregame training and predictions are fantastic, but all boils down to playing the game. It’s about doing the work. It’s about execution. Goals are necessary, organization sets the framework, but in the end it’s all about the execution. To continue our Fall #MemoryMakeover series, this month we will focus on execution. Putting all we have planned for into motion. We’ve set our memory goals and discussed habits to help. We’ve organized, found tools and how-to tips to assist. Now it’s time to get going on all those memory hopes and dreams. November can be a great month procrastinate with the busy holiday season coming, but let’s not put things off any longer. Procrastination only makes things worse. It can happen at any age, but as we get older, we tend to procrastinate more often. Postponing complex tasks is easier than learning new. Routines are less taxing and more comfortable for our brain. The reason I advocate for implementing new habits is to counteract the comfortable, challenge ourselves, but also to create healthier patterns. Habits are great learning tools for our brain and the sooner we begin, the sooner new ideas and practices become routine. Over the next few weeks, we’ll look at execution habits, research and memory tips. But the most important place to start is at the beginning. With the decision to just do it (whatever the ‘it’ is)! Just do it! Take a small step toward your goal today. Any step is a good step. Utilize all that’s been organized and start. Often once we take the first step, the next and the next come easier. Enlist a friend or family member to join you! Anything can be made more fun with friends. Yes, our goals may be related to our own personal memory, but many of us share the same issues-remembering names, appointments, keeping up and remembering new things in our lives. When we share with others, it creates accountability and increases the chances we’ll continue with our execution. Keep going! It’s difficult to always see what’s next. But the future is a whole lot clearer when we keep moving forward. Assess as you go. The first steps are most difficult because they’re unknown. But once we are on the path toward our goals, we may see things that need to change. Assess as you go and adjust as needed. Sometimes memory techniques may not work as planned or other things may need to be broken down into more steps etc. Assess and adapt to move forward well. This week’s #MemoryMakeover homework is guess what? Execute! Just begin on your steps toward your memory wellness goal(s). Execution begins with the first step. 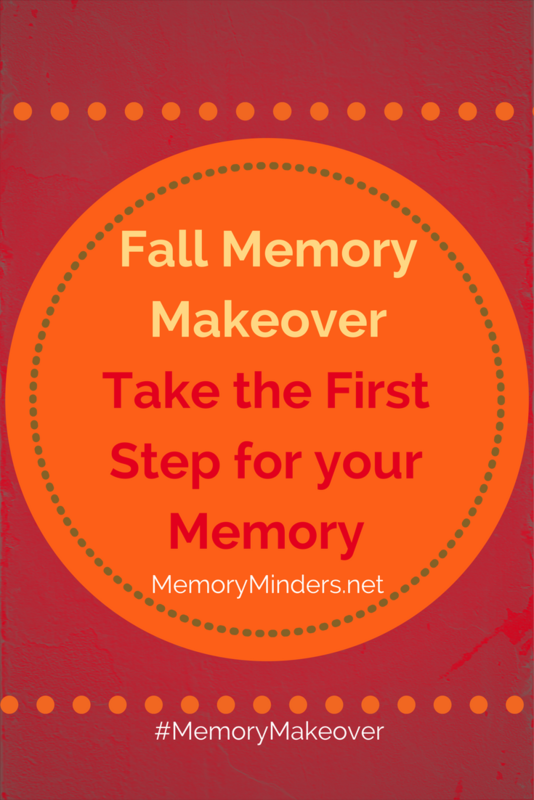 Let’s take those critical first steps toward our memory goals and more memorable moments! Don’t forget to let me know how things are going with a comment below or on Facebook. Here’s to excellent execution on our #MemoryMakeovers!